BEVERLY — Heidi Whitman’s trippy paper constructions whip notions of mind and space together in frothy cocktails of the physical and the metaphysical. Her work’s origin story is on one red wall in her show at Montserrat College of Art’s Montserrat Gallery. More than 30 drawings from three series made between 1998 and 2001 and one from this year hang in a loose grid. Several early pieces revolve around a head shape. Then the head begins to explode, and to blend with depictions of space. In order for Whitman to give form to the workings of the mind, she needed to envision it as a physical space. The clunky literalism of the head no longer weighs down her recent drawings. “Mental Map (7)” is a fizzy network of dots and lines in red, black, and white, synapses firing and connecting. The drawing installation itself maps Whitman’s ideas through time. But the drawings are just notes. Whitman’s ambitious and ethereal paper constructions carry her ideas to fruition. She builds them around a fragile armature of cut-paper grids that echo city maps or buildings, but they warp and loll off the wall, casting shadows. How is someone’s mind like a city? Bustling, alive with connections, but wildly more plastic and less tangible. For the knockout “Small World,” Whitman applies fogs of blue and brown directly to the wall, over which she draws series of rectangles, suggesting city maps. Then she attaches the cut paper — black smudged with white, beige layered with black, rising and falling in on itself, casting shadows. This might be the city’s psyche, rupturing, wilting, and stitching together. Smaller works, such as “Lost City of A,” feel less urban. Whitman has drawn a treasure map, or a chart from antiquity, then cut, shuffled, and suspended it from the wall. A ribbon of black paper weaves through, the trail we should follow. As Whitman imbues her maps with new, three-dimensional life, she hints that the world, too, has added dimensions of space and time, and that her map will lead us in new directions. Almost certainly within. Sisyphus comes to mind when viewing Rachel Mica Weiss’s sculptures at Montserrat’s 301 Gallery. There are no hills, but there are rocks, metaphors for the stuff we strain against and work to overcome. Weiss is eloquent with her materials; her sculptures are succinct and packed with implication. “An Unnecessary Gesture” sets up tension between a maple frame and a chunk of black granite, tethered by strands of braided leather. The pale wood leans away from the dark stone, but can’t escape it; they’re bound together by soft, beautiful chains. Similar leather bonds hold rocks inside frames on the wall in the triptych “Chained Portraits Triptych.” The black, craggy stones stand in for portrait subjects. The two on the outside, in diamond-shaped frames, appear unyielding and trapped. The center triangular frame cradles the rock inside, and the braided leather droops softly around it. Like “An Unnecessary Gesture,” “Portraits” reflects on relating, whether to another person or to some aspect of yourself. Sometimes, the tension inexplicably melts. For “Draped Stone,” Weiss has cast a concrete-based, marble-like material so that it gives way and folds like a noodle over a horizontal band of maple — a rock relaxes, so that it may snuggle with its partner. The artist’s installations “Pivoted Planes” and “3-Planed Vaultway (Locked and Crossed)” in the building’s storefront windows mimic architecture with yarn. The functional infrastructures they reference echo the brawn of rock in her sculptures, but depicted in swiftly rising panels of strung yarn, they’re airy and mystical, like chutes to heaven. 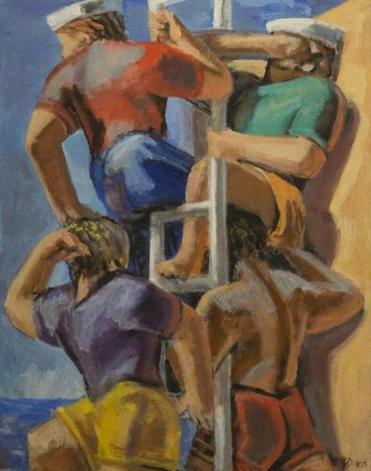 The nimble painter Grant Drumheller’s show, at Barrington Center for the Arts at Gordon College in Wenham, begins with a brilliant painting from 1980, “Sailors’ Lookout.” Sun-splashed burly men, one above the next, nearly interlock on a ladder. It’s central, it’s totemic, and in that way contradicts most of the other pieces here, but still it connects. In recent works, Drumheller takes a wider perspective. In bird’s-eye-view vistas such as “Fourth of July,” we look down on sunbathers enclosed by water and trees, and “Escalator” has us gazing through and over a glass-enclosed escalator into a public square below. He leads us through complicated spaces that seem to close in and open up unexpectedly. Inevitably, we track the figures, our eyes darting this way and that. The artist’s gestures are wet and loose, but economical. The people, from afar, make perfect sense, but up close, dissolve into abstract squibs of color. There’s an echo of the sailors in “Fat Boys and Flying Horses,” a surreal circus scene, one of many Drumheller paints using toy animals as models. In some, he piles the animals like the sailors, but in this one, horses fly through a hot golden shimmer amid tilting ladders. Corpulent naked men ride the horses, sometimes clinging for dear life. They are the young sailors grown older — no longer on the lookout for life, but comically exposed and knowingly mortal.